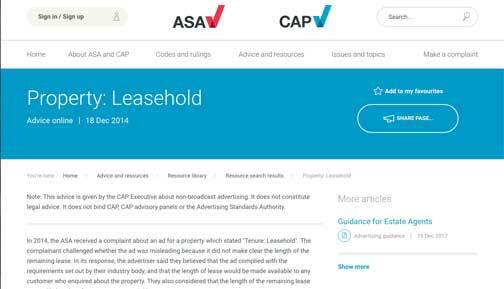 In 2014, the Advertising Standards Authority received a complaint about an ad for a property which stated “Tenure: Leasehold”. The complainant challenged whether the ad was misleading because it did not make clear the length of the remaining lease. In its response, the advertiser said they believed that the ad complied with the requirements set out by their industry body, and that the length of lease would be made available to any customer who enquired about the property. They also considered that the length of the remaining lease was unlikely to be of concern to a potential buyer. The Advertising Standards Authority noted that the number of years left on a lease could affect one’s chances of obtaining a mortgage, could impact any potential resale of a property and that majority of lenders were likely to refuse a mortgage if the lease had between 50 and 75 years remaining. A small number of lenders might refuse mortgages if the lease had fewer than 95 years remaining. In this case, the Advertising Standards Authority did not uphold the complaint because the number of years remaining, 101, was considered to be sufficient (Chesterton Global Ltd, 26 November 2014). Getting an Advertising Standards Authority ruling against aspects of leasehold property marketing would be very useful ie that it is not homeownership but a tenancy. Developers talk incessantly about “homeownership”, “your home”, “your property” when flogging these tenancies – and then tell you that you are a tenant when demanding ground rents, when you want to build a conservatory or keep a cat in a flat. Then you are just a leaseholder who has to pay up. And, of course, estate agents invariably fail to give the years remaining on a lease. When you look at adverts where loans are mentioned or a mortgage or an investment product a very large screed of small print has to be added to the advert – in radio adverts this small print has to be read out and at great speed . Properties for sale are required to show how energy efficient they are. Remaining lease length, current annual service charge, and annual ground rent should be shown also, without the need to do further digging with the estate agent. I don’t think that information is too much for most, Stephen. If it can be done for a Fiesta it can be done for a property! So we should provide advice at point of sale if the ground rent is more than 0.1% of the capital value of the property in question? What happens if ithe ground rent doubles every 20, 15, 10 or even 5 years? Should we make that clear? Or what happens if the ground rent increase is linked to the increase of the capital value the property or even the capital value of the estate? Should that be made clear? If ithe ground rent is linked to RPI should we explain what RPI is? How unsuitable it is? It’s flawed history? Then there is the future cost of the lease extension or freehold purchase. Should we spell out the probable cost of this? Shall we explain the likely cost based on a 7% cap rate but explain that there is no guarantee they will actually get 7%? Shall we explain at point of sale that freeholders are currently spending hundreds of thousands of pounds to argue a 3% cap rate in Tribunal and the cataclysmic effect this will have on the cost of the lease extension? Freeholders would love us to agree a simple explanation at point of sale as if this will make this complex quagmire fairer. It won’t make it fairer it is far too complex. It would just give the illusion that we have done something to end ground rent absuses. Cap ground rents. Outlaw aggressive ground accelerators. Make the calculation for a lease extension or freehold purchase 10x the ground rent. Consign the medieval feudal leasehold system to the history books. A 4% cap rate seems fair to you does it? That’s because you own freeholds Stephen and you will get rich from it. Not so fair though if you bought a house for 225k and the ground rent doubles though. It would cost you the best part of 110k to buy the freehold! Your ideas amount to ‘let’s prescribe all these various things in favour of the freeholders so we can continue to make a fortune from the blood of the leaseholders like parasites and the little old leaseholders can save a bit on legal fees’. It must be scary for you knowing that as we speak the Law Commission are devising ways to alter the ridiculous valuation principles to actually make it fairer for leaseholders as you and your ilk have money invested in it. You cling to the comment made by the LC about ‘the human rights of all parties’ like a life raft. Remember though after they talk about human rights in their proposal they then went on to propose three options. Prescribing cap and deferment rates, introducing 10x ground rents or moving to term and reversion only. None of these even slightly take into account the freeholder’s human rights. There are numerous examples in history of the Gov altering contract law if it is in the ‘public’s interest’. The vile abuses of leaseholders by amoral freeholders over the centuries could not fit this category more. The end is nigh! Finally we can consign this leasehold system designed by freeholders, made law by freeholders and perpetuate by freeholders to the history books, like the rest of the world has. A 4% cap rate seems reasonable when discounting a large rent. The risk free rate has collapsed since Sportelli and needs to be reviewed. The Ogden rate used in personal injury claims settlement fell from 2.5% (set around the time of Sportelli) down to a negative of 0.75% about one and half years ago. So if the risk free rate is minus 0.75% and the long term inflation rate is 2% and the other risks appropriate to holding a ground rent is a further 2.75% you get 4%. You seek to justify your stance that full compensation should not be given by citing examples where there has been abuse by others on other property. Stephen, many freeholders including ours made a healthy profit when the flats were built / converted. They do nothing for the ground rent, which is merely a legacy feudal agreement which shows they are the freeholder and we are leaseholders. Contract law has the principle of consideration, in other words you do something for your money. They make a healthy profit also on the service charge. Why should they be able to keep going back to the well to get more money through ground rents and lease extensions ? Freeholds should never have been classed as an asset that could be sold on to ground rent speculators, because the freeholders in nearly all cases do nothing for the money. It cannot be compared to investing in shares for example, where the money invested is used to help grow a business, or is at risk in the event of failure. I agree; the ground rent is for no service – it is of course a burden on the property and needs to be valued prior to an offer being made. Best then to get rid of leasehold and ground rents altogether, because the freeholder does nothing for their ground rent. The freeholder / developer can make sure they get adequate compensation when the flats are first sold. If investors have bought a freehold in the hope of getting an income from it, and the value of the freehold falls because circumstances change that is their look out. The same happens with other investments like shares or property. Freeholders like ours who profited well when the flats were first developed and sold deserve no further compensation. The ground rent loss could be compensated for by a larger initial purchase price on sale of the property. The employee could be paid more whilst at work to save into his own private pension, which many do (with the aid of tax relief). The employee gets his work pension as part of the consideration for the work he does. You have said earlier that a freeholder does nothing for the ground rent. What is he offering to the leaseholder for the ground rent ? Nothing at all. You are now saying that he should be paid a purchase price, and on going consideration ie ground rent each year for the property. The purchaser then has to check if the ground rent terms are fair and reasonable. Somehow every other advanced economy gets by ok without using the leasehold and ground rents model. It is time for England and Wales to phase out leasehold. If investors decide to invest in freeholds for the ground rents, then they need to know the value may fall if conditions change. The point I am making is this. At the point of sale the freeholder is offering the flat and seeks a premium of £x and in addition seeks a regular payment of £y per annum which will be a pure profit stream to the freeholder. The freeholder has done nothing for his ground rents in many cases anyway so what is he losing ? Just charge a reasonable price on initial purchase, why does the freeholder need an undeserved income stream later ? Is a rouge landlord someone who is red in the face with embarrassment, they should be. I am no expert , but if someone had told me when I bought my flat that in 19 years time I would have to extend the lease , I would have avoided it like the plague. The solicitor never explained the implications of such an arrangement. My flat has cost me more in real terms than the cost of a freehold house. Another thing, why do you need a mortgage to buy a lease. One definition of a mortgage is “ A loan of money which you get from a bank or building society in order to buy a house “ . Why not just get a bog standard bank loan, after all I only own the right to live in my home for the period of the lease I apparently don’t own the actual bricks and mortar. Just to be clear I don’t live in Belgravia, but I wouldn’t mind if I could afford to. Hopefully the cost of a lease extension or buying the freehold will be very much cheaper in a few years time, along with an easier Right to Manage process. I went to see a solicitor who was not acting for me before I bought my flat. He wrongly suggested to me that Right to Manage meant we would have to do everything ourselves, rather than sub contract the servicing to a new management company. The complexities and cost of the leasehold system discourage Right to Manage, and buying the freehold as a group, especially when a large minority of leaseholders in a building take little interest in it. Having looked at the wrinkles surrounding leasehold in the last 2 years and knowing what I know now, I would not have bought my flat. I am not the only one. He adds that leasehold title property ownership is possesses “structural disadvantages to the consumer homeowner that can be avoided by legislative reform”. He urges that leasehold houses be transferred to freehold immediately, and that leasehold flats become commonhold. Might I say to you gently, Stephen, go away. Based on a sample of one, onerous ground rents are always a result of leaseholders doing an informal lease extension to sell their lease on the not unreasonable assumption that the buyer’s solicitor will not effectively communicate the implications to the purchaser. In most cases the value of the lease will have ‘doubled’ in ten years and the existing leaseholder will have further profited from a generous ‘income stream’ from the excess of rent charged to their tenant over their mortgage payments. The existing leaseholder is out to ‘maximise’ the profit on their investment by any allowable means. As somebody said, “we’re all in this together”, except for those who rent. John, do you mean the freeholdor getting a generous income stream from ground rents ? In my case we have a freeholder for the building who does the management so gets income from the servicing and ground rents. As a leaseholder I sub let my flat, so my tenant is affected by high service charges as well if I am to make any return. The service charges have increased well beyond normal inflation over the last 20 years. I will add that the value of leasehold flats in my area of Yorkshire have declined substantially in recent years, mainly as a result of the difficulties with the leasehold system. I bought my flat 3 years ago due to circumstances then, and not knowing all the issues with leasehold. You may be speaking as a tenant in a leasehold flat. The problem I have as a landlord is absorbing the excessive costs charged by the freeholder and being fair to my tenant. I will have to pay for a lease extension in a few years, under the present system, it will cost at least £4000, leave it 15 years it would cost a lot more. London may be a different market to the rest of the UK, where you pay silly money for a garage. No Simon, I meant what I wrote. I have given details of my situation in earlier posts unlike many contributors. I own the freehold of my very modest home, but am interested in the subject because a friend bought a leasehold property apparently like you did. In my view both of you want, to quote your words, an income stream from doing very little, so that you differ from the castigated freeholders and developers only in degree . The developers do have the redeeming grace of actually providing the roof over our heads. Tent or pavement anyone? oops, the quotes are from Crispin Blunt, CONSERVATIVE MP for Reigate. Stephen, we all have brain cells, the measure of a man is how he uses his brain cells. You have decided to use your brain cells by being rude – I assume you have nothing worthwhile to offer to the debate. Reply to John’s last post 17 August. I get about 4% after costs on my leasehold investment. I do not have a mortgage on the property. The flat has declined in value, and I have to make sure it is safe and in good condition for my tenant. I would like to sell my flat but do not wish to do so in a strongly declining market. A better system, getting rid of leasehold for flats would benefit everyone, especially the leaseholders and their tenants if they sub let. I would get a better return on stocks and shares. Not all landlords are the same, and making a big income. I am a reluctant landlord because of circumstance, and if I sold now, it would probably be at a big loss to another landlord rather than someone who wants to live there as the leaseholder. It is not the case that all landlords are making a nice profit and tenants are being exploited, there are good and bad landlords and tenants. My tenants are very happy with the property.